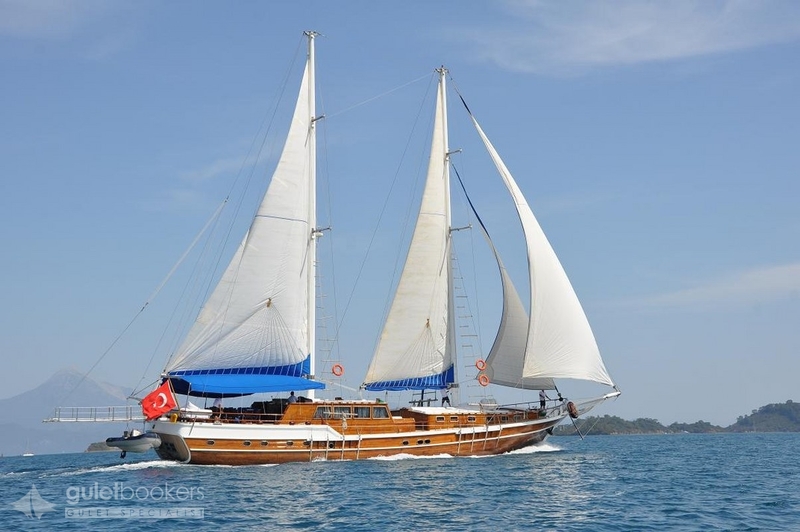 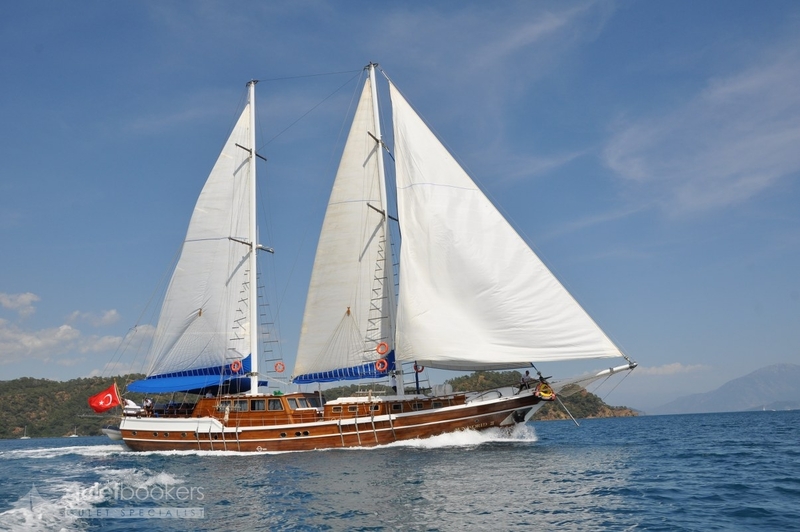 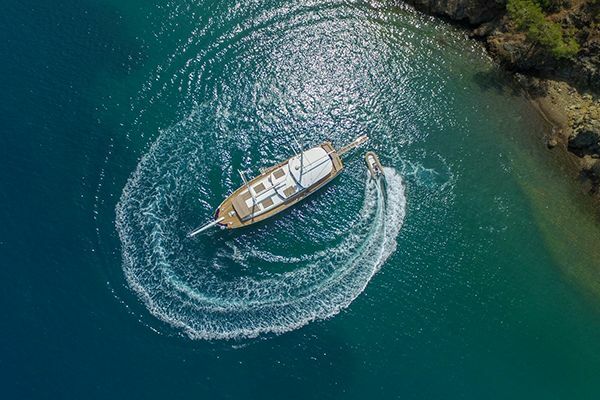 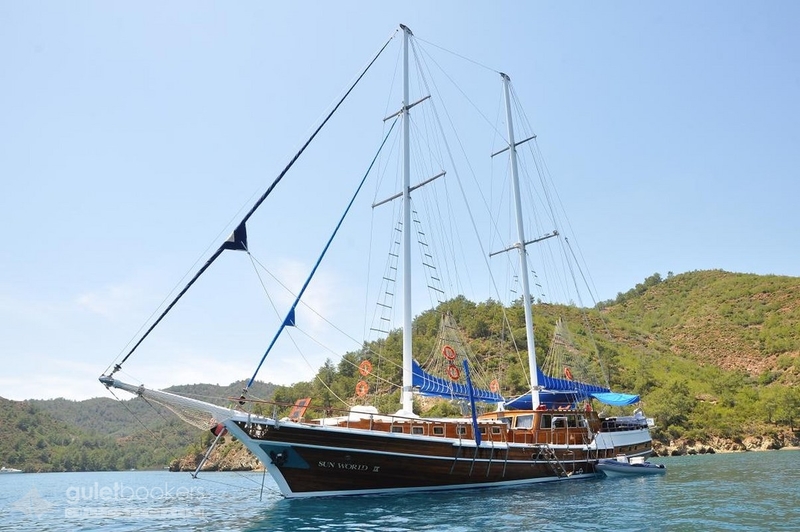 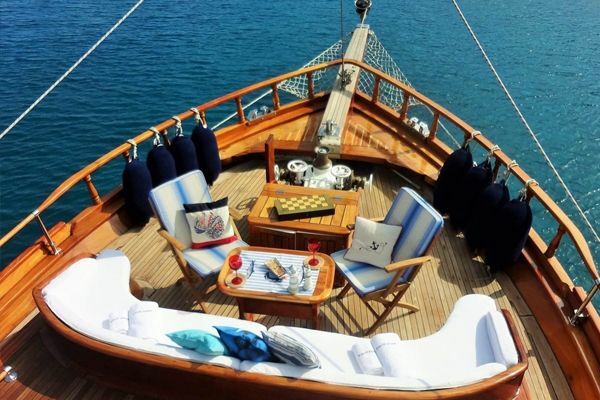 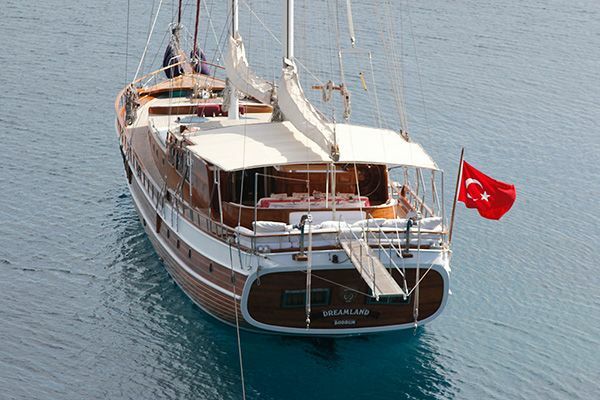 SunWorld 9 is a classic wooden luxury Turkish Gulet which offers the best of gulet charters out of Bodrum for large groups or families of up to 16 guests. 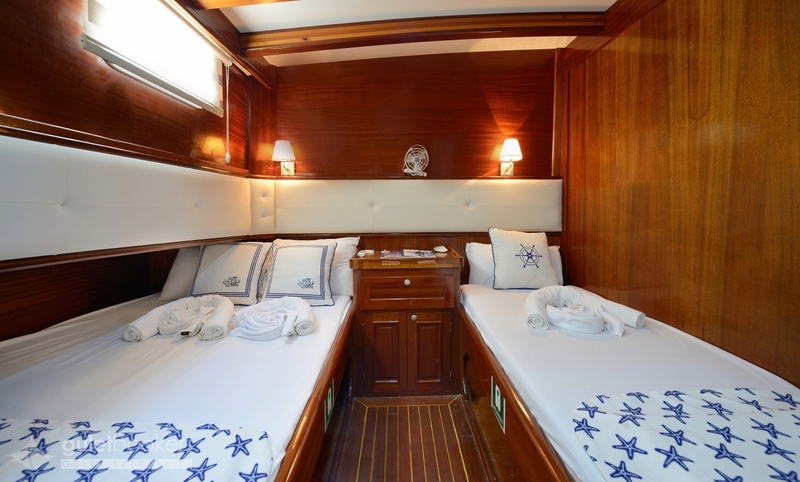 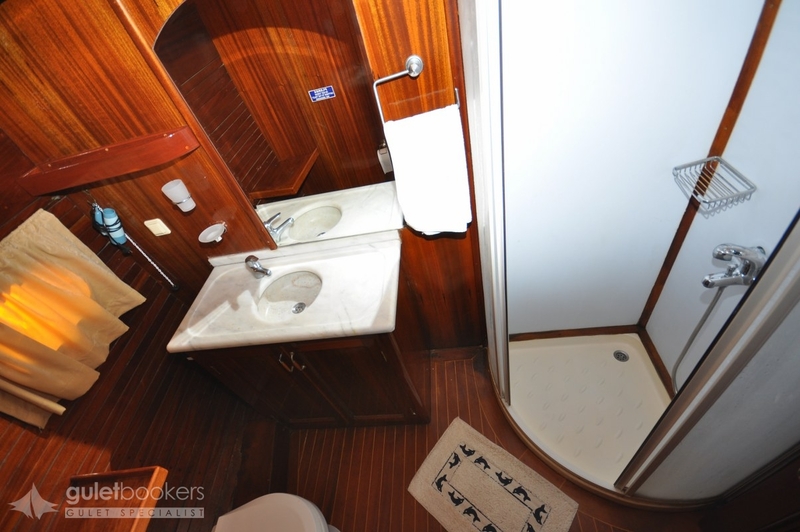 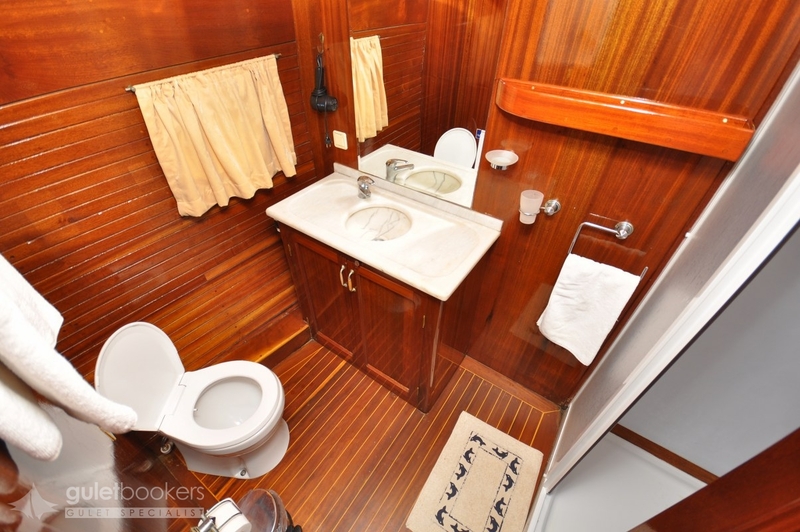 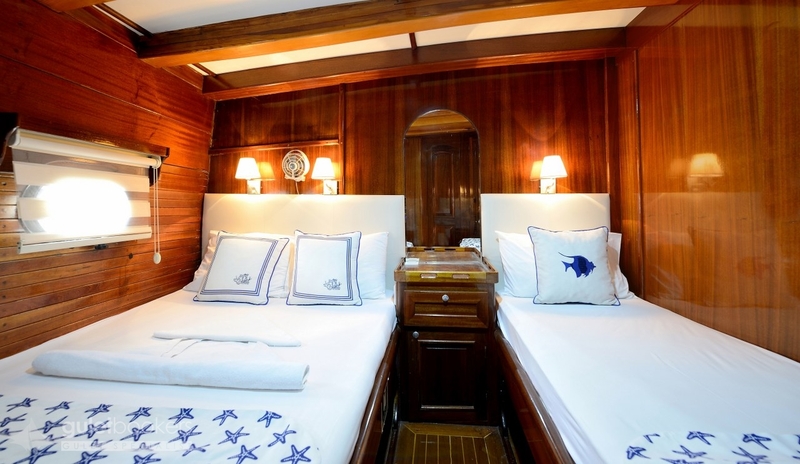 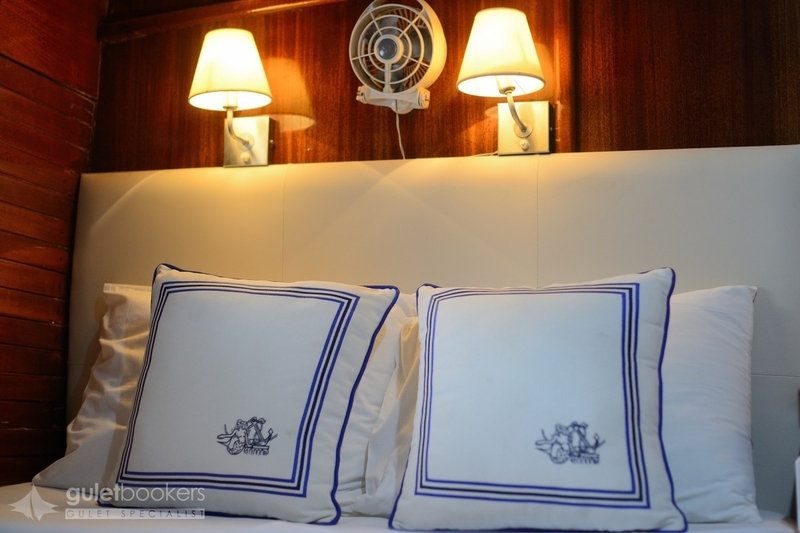 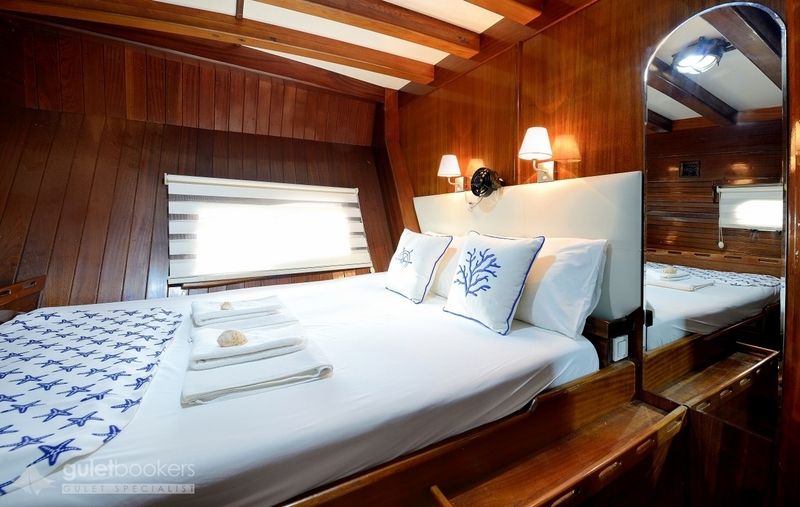 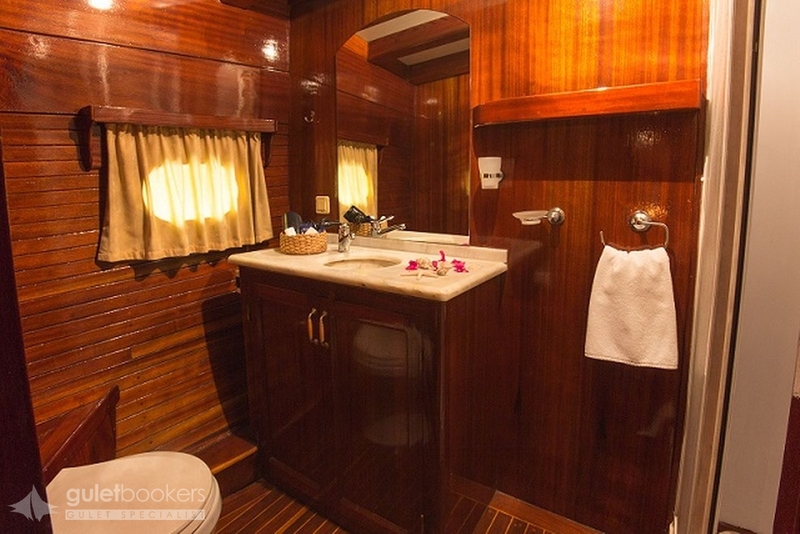 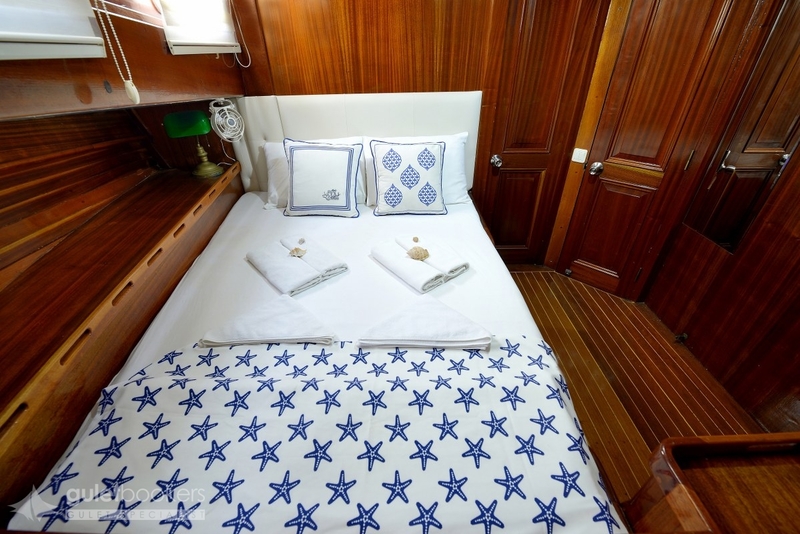 The beautifully maintained sailing yacht’s generous hull holds two separate groups of two double bed cabins and two double plus single bed cabins each, all similarly sized and enjoying their own shower bathrooms and air-conditioning. 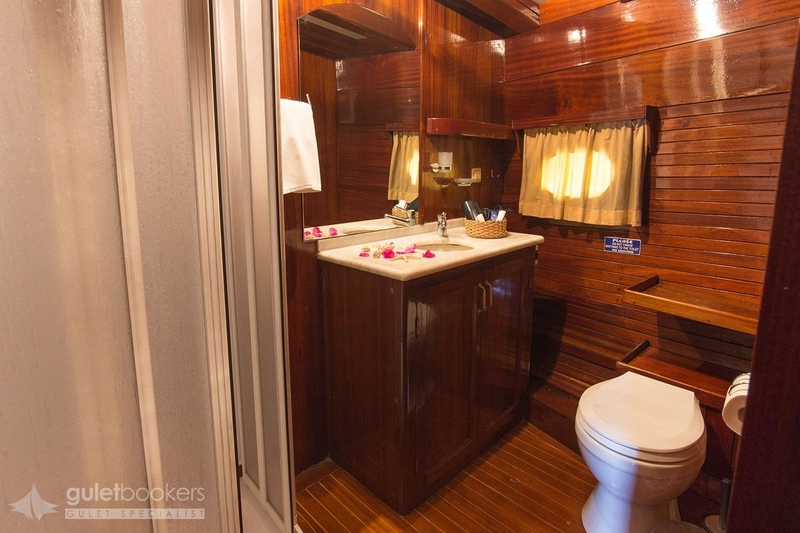 The cabins are placed each side of the plentiful communal indoor space of the saloon with a seating nook for relaxing, or using the TV/DVD system, or the indoor dining table. 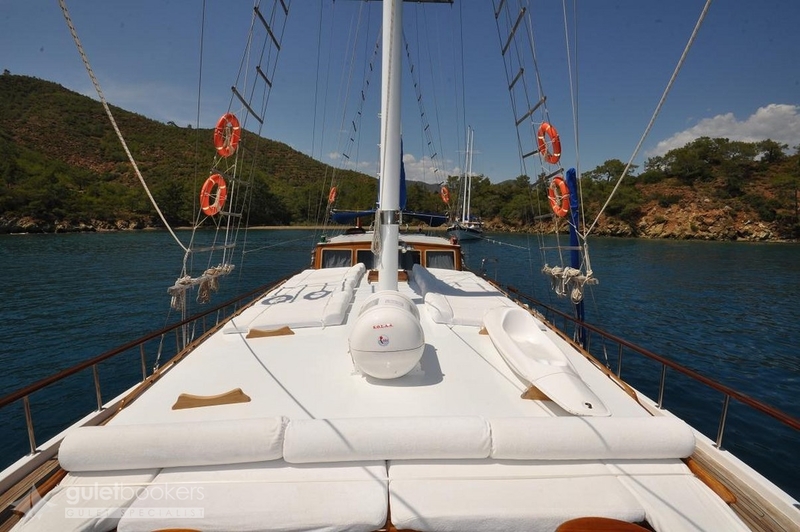 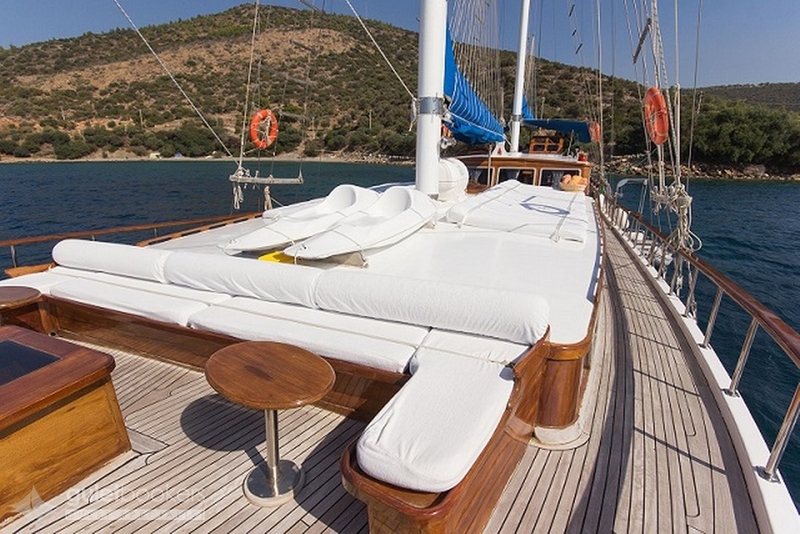 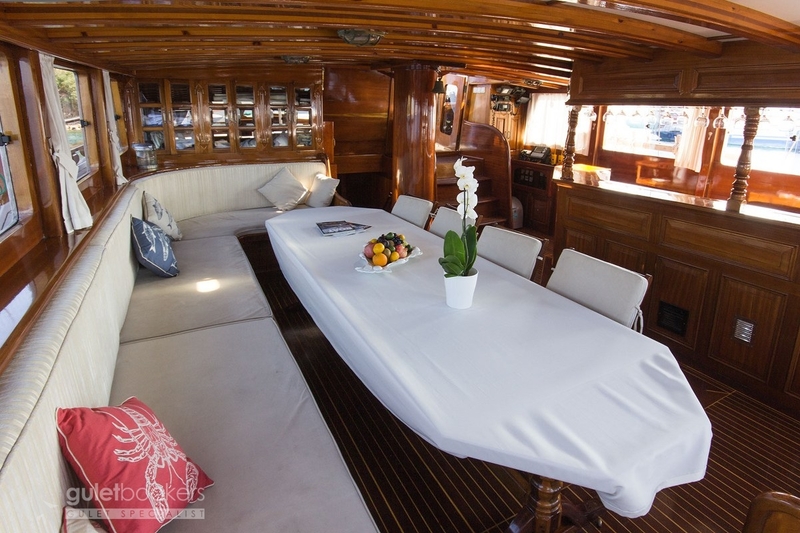 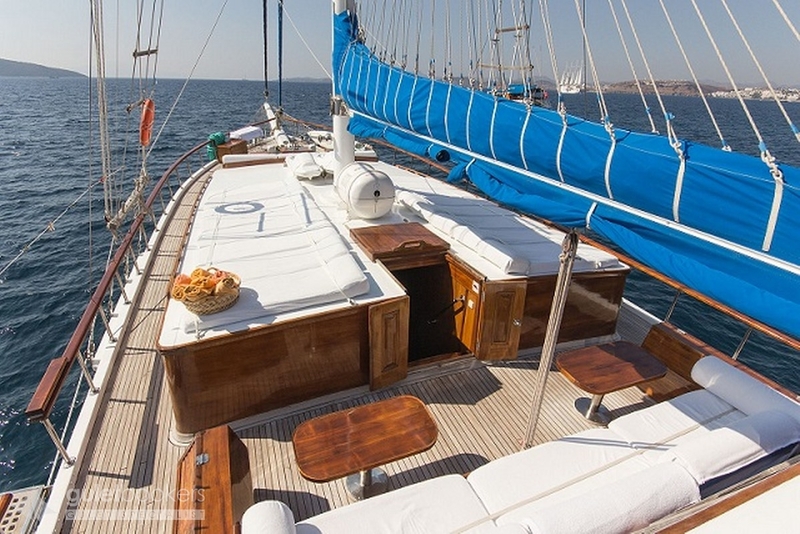 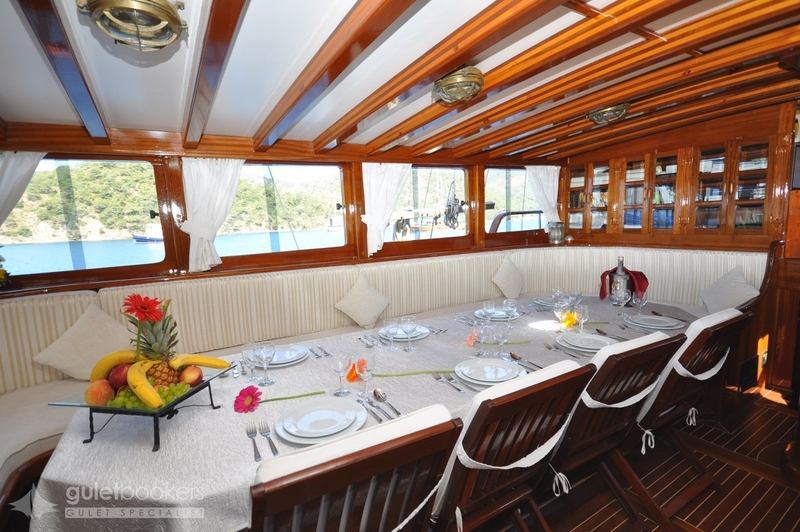 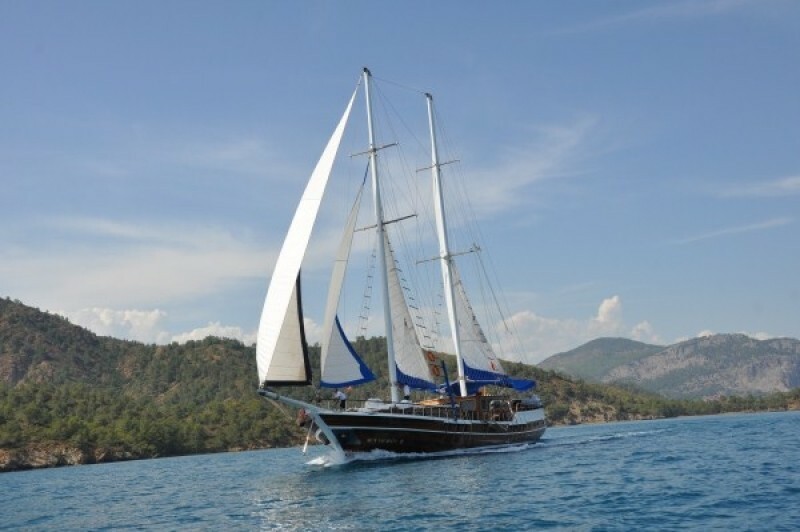 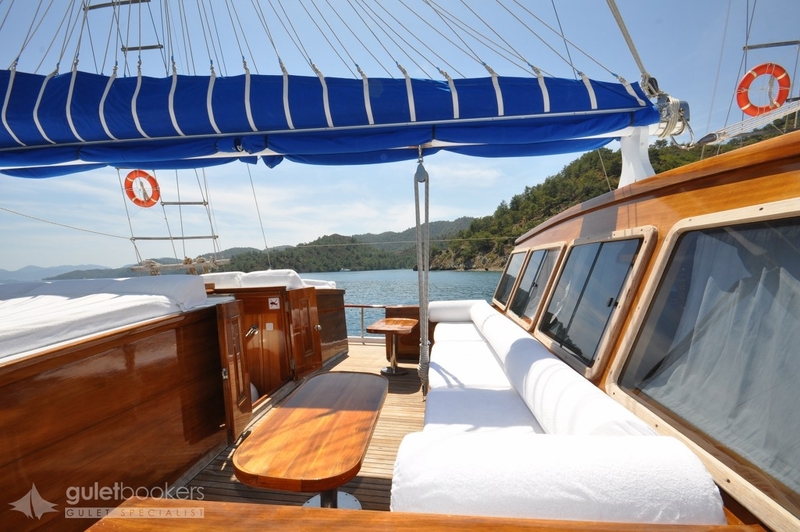 But guests revel in the open air life of a gulet cruise on the Sun World 9. 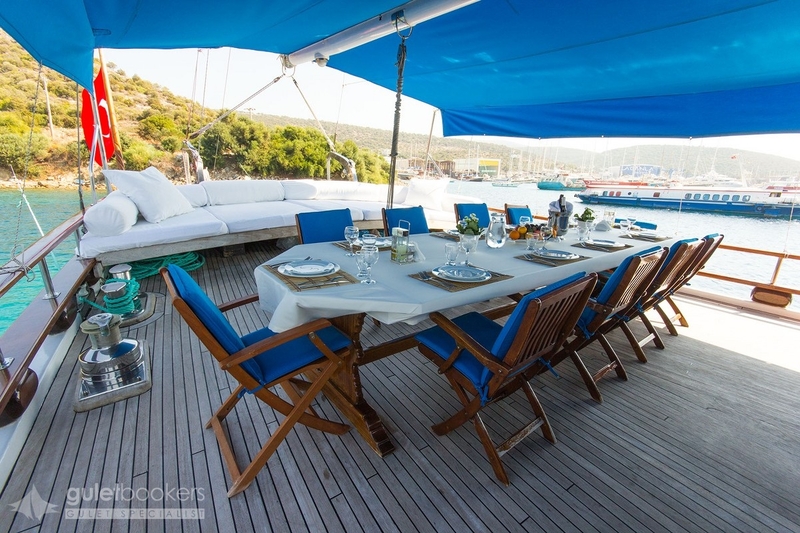 On the aft deck under the awning a wide cushioned couch invites for some serious chilling in the shade, while the large table is the focal point for enjoying excellent meals presented by the crew. 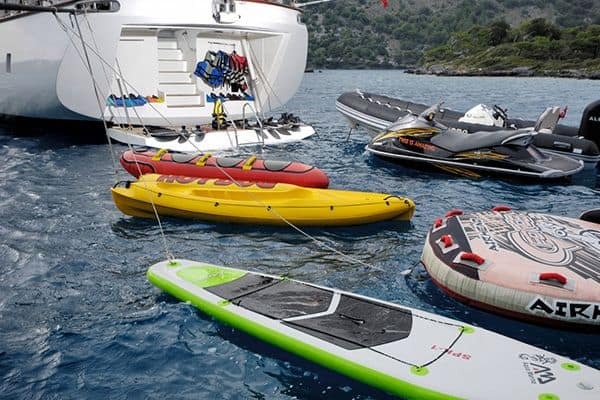 Water sport toys, canoes, snorkels are all at hand for those who love to get into the water at every anchorage. 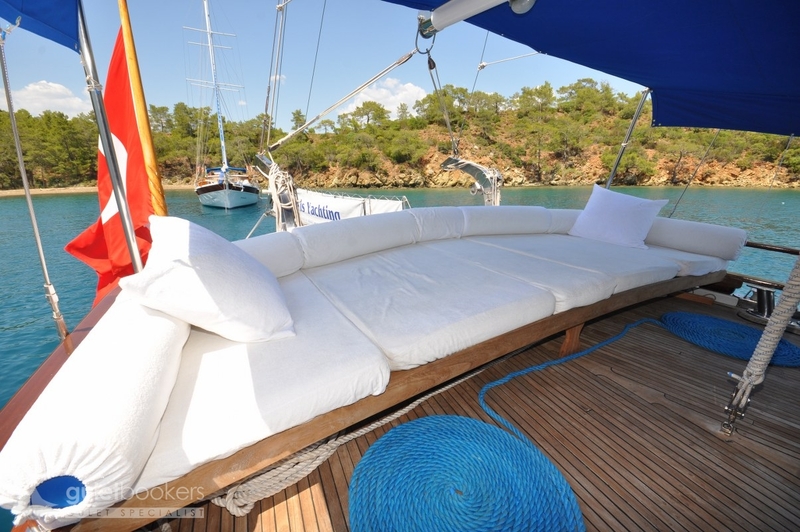 With lazing space in the shade or sun, there are more sunbeds on the fore deck, and plenty of room for everyone to find a spot to relax. 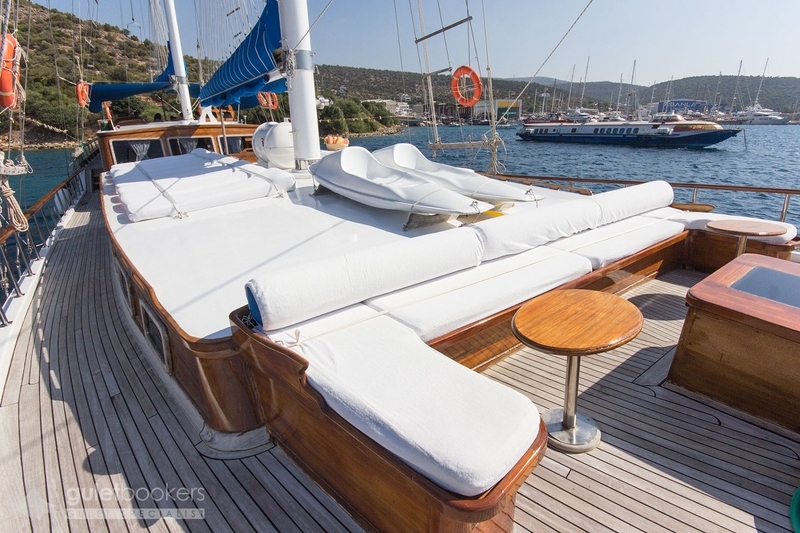 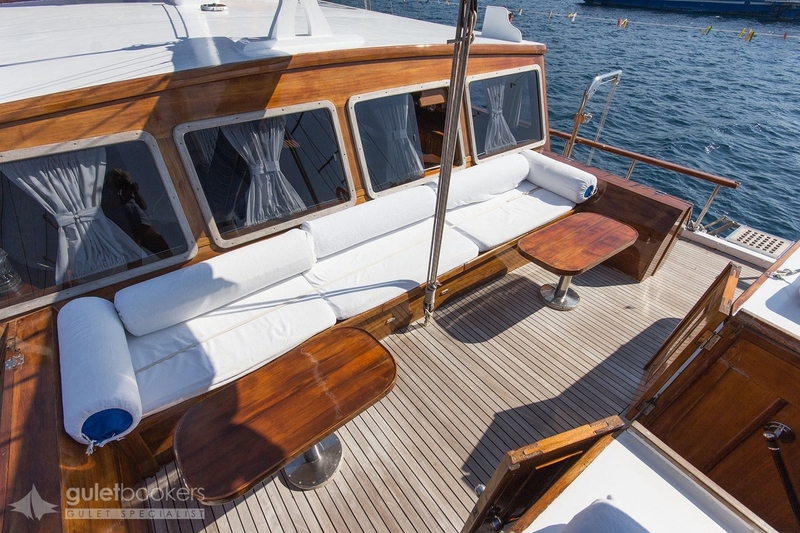 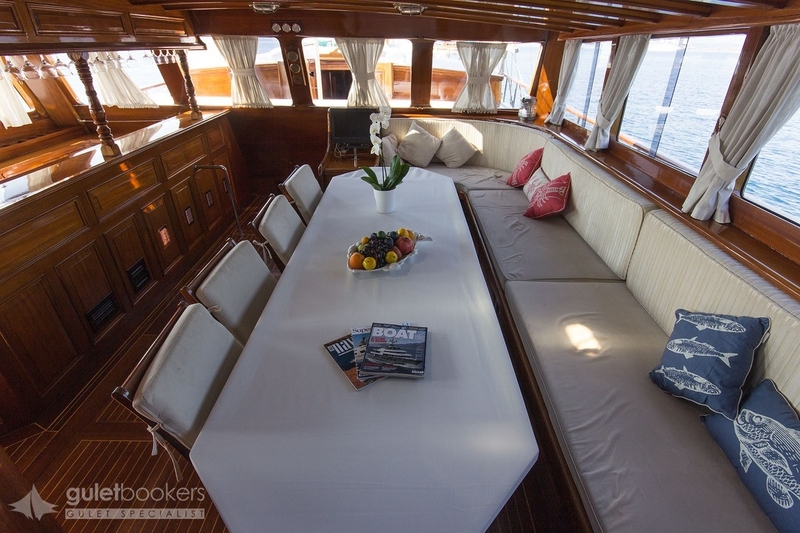 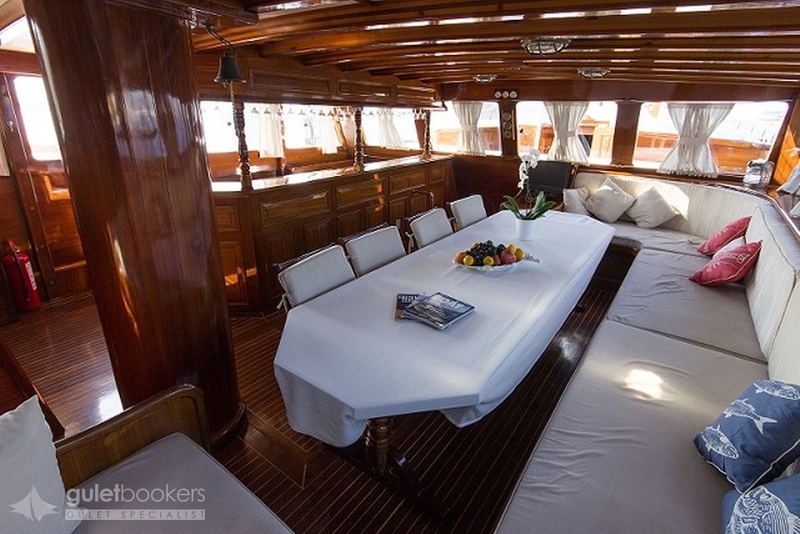 There are two couched seating benches on the fore deck, one forward in the bow just perfect for end of day sunset drinks while taking in unique views of the Turkish and Greek Islands coasts. 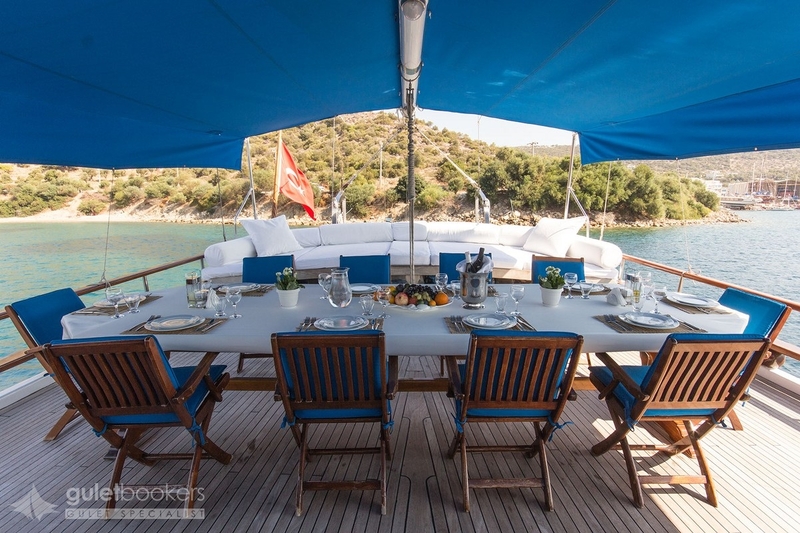 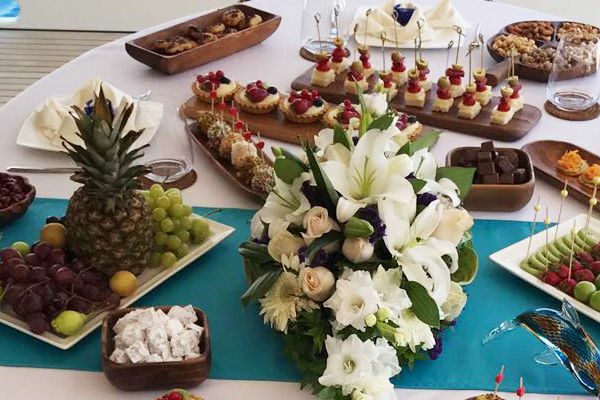 The captain and crew of three will take care of all the meals, cleaning, yacht work and be on hand for the guests, to help everyone have an unforgettable cruising holiday on a very special gulet, the Sunworld 9, which is one of the few gulet charters able to take over twelve and up to sixteen guests into Greek waters.